Social media has the power to make your site go viral, and it can prove to be the only traffic source you’ll ever need. There are various social media channels such as Facebook, Twitter, Instagram, Pinterest, and many others. There are millions of users on each of these platforms, and it takes a lot of time to create, manage, and publish post even if you chose to target only the popular ones. But, what if you’re a busy blogger and manage multiple projects at any given time? Would you be able to make time to post on these social media channels and at the right time? For me, it wasn’t possible. So, I had to look up for an efficient way to schedule social media post at the right time. And my search for social media marketing tool started. I used many such tools like BoardBooster, TailWind, HootSuite, and few other popular ones. Each of them had some fantastic features, but none of them were able to suffice my requirements. Being able to post on various social media channels. Able to pin on multiple Pinterest Group Boards. Help with the best time when I should publish based on my audience. And last but not least, doesn’t create a big hole in my pocket. Thanks to, Facebook Ads, I got to know about ViralTag, which proved to be the best social media marketing tool I have used so far. Now, I won’t say it is perfect, and it will stand true for all your needs, but it did for me, and that’s why I’m writing this review. Disclaimer: I only recommend products I have personally used and love. However, this post includes affiliate links, and I’ll earn a small commission if you decide to make a purchase, at no extra cost to you. Thanks for your consistent support. Without taking much of your time, let’s get started with the ViralTag Review. How Much Do ViralTag Costs? Quick Intro: ViralTag is a popular social media marketing tool that can handle almost all your social media accounts from a single dashboard and allows you to schedule multiple posts to all your social media accounts with one mouse click. In this ViralTag review, I will walk you through its features, pricing, functions, pros, and cons. Also, there are a free $15 credits included + a free 14-days Trial for you to take a test drive. As discussed earlier, ViralTag is a social media marketing tool that can efficiently manage multiple social media channels for you and helps you schedule posts. Unlike HootSuite, ViralTag is image-focused which means, it is more suitable to post visual contents rather than just texts. I have mainly used it for Pinterest and Instagram, both being visual-focused social sites. However, it can work flawlessly for other channels too as long as you’re attaching an image with the post. At current, you can manage the following social media handles using ViralTag dashboard. Although there are tons of good reasons why I recommend ViralTag to others, here are few worth mentioning that stand out. ViralTag provides multiple scheduling options which include Queue Scheduling, Interval Scheduling, and Post Now. Queue Scheduling: Queue scheduler works as a preset scheduler calendar which enables you to schedule your post for different dates and times for individual social media channels. By default, there are few posting schedules defined which you can freely edit and customize. When you post a new pin or image, you have the option to either schedule it to the predefined scheduling time or post on another specific date and time. Interval Scheduling: It lets you bypass your current scheduling timings and publish a new post with the desired frequency. It is a brilliant way which helps very much on special events such as Black Friday, where we can schedule a new deal every 15 minutes starting at 12:00 AM. Also, Interval scheduling doesn’t affect your other schedules, and all the different schedules will be published individually. Post Now: As the name suggests, this feature allows you to publish something at any given moment. It is great when we have to share some important news without affecting our previously scheduled posts. Also, you don’t need to use the same description, size, or hashtags while scheduling an image, you can change these for different social media channels. Another great feature of ViralTag is in-built ‘Explore’ tab which helps you find terrific contents and share with your followers without leaving your ViralTag dashboard. Since ViralTag is visual-focused, most of the suggested images are matched for Pinterest which is great for an avid user of Pinterest like me. There are various categories available which you can choose to find images or alternatively, you can search for the targeted keyword to see the related pictures. For instance, I searched for Quotes and boom! It will give out some of the trending posts which I can share with my followers. The explore features is a real time saver when you ain’t got a lot of time to search and share good things. Yes, it’s there. Now it won’t be a big deal for many of you as we all have our decided tools which we use to create images. But, the image editor tool given in ViralTag is integrated with Canva which means you can freely develop beautiful graphics for every social media channel. If you use Canva to create images (like I do), then it’s good to know that there’s one great feature provided. ViralTag has another useful tool called ‘reports’ which gives a statistical view of how your accounts are performing and which social channel bring in the most traffic. Every social media channel is represented by a different color of the line which makes it easy to understand. You need to connect your Google Analytics account to see these reports. 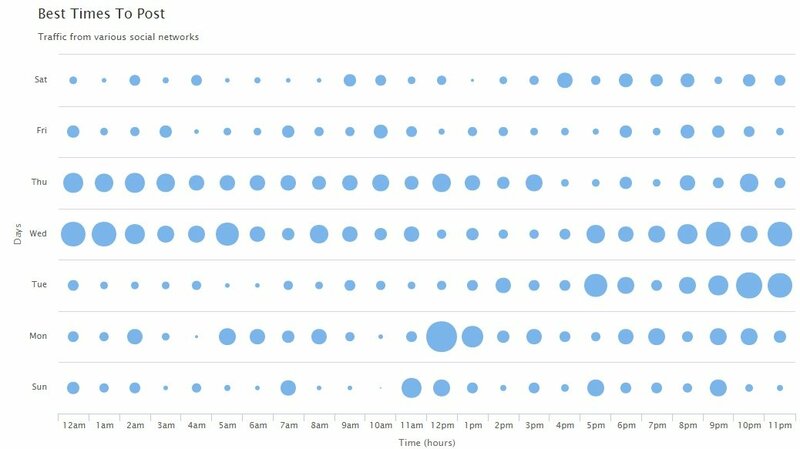 Below the traffic report section, there is another section called “best time to post” which gives a visual representation of at what time you should post based on the traffic and user engagements. You can also see the Pinterest specific data using the Pinterest tab given. Here are my reports for the last 7 days. ViralTag has another time feature which is bulk uploads. Bulk upload lets you schedule multiple photos, pins, videos, or other files, at once and never bother about it for an entire month. You can use the ViralTag Chrome extension to schedule multiple pins/photos from any given website, or you can directly connect it to Google Drive or Dropbox to pull the contents in bulk. ViralTag also has an option to invite your team members and let them curate and schedule posts without having to keep planning over excel sheets. However, this plan is limited to business users, only. The main power of any tools is often decided by the customer support, and if you aren’t being provided with the satisfactory backing, then there are least chances that you would spend your money on that tool. ViralTag doesn’t have a 24*7 support team, but the staff out there are great and knowledgeable. Maximum of the support is handled by the CEO and founders of the tool which is unexpected and unseen. I contacted the support team various times and the maximum time I had to wait was 40 minutes until I got a positive response with detailed instructions. However, I do hope that they enable the 24/7 support feature which will be better. As the time of writing, there are three different plans available to choose. The Individual plan (1 user) starts at $29/month if paid monthly, and $24/month if paid annually. You can add up to 10 social profiles with this plan. Recommended for bloggers and individuals who don’t work in the team or use very few social profiles. The next plan is ‘small business’ which is priced at $99/month if paid monthly, and $79/month if annually. Here, you can add up to three different users and up to 25 social profiles. Most recommend for team workers and small business owners which may have to handle many social media profiles. And the last plan is for ‘Brands’ which is priced at $249+/month and allows 5+ users and 50+ social profiles. There’s a demo button available using which you can ask for a demo account for Brand users. All the plans come with ‘unlimited’ scheduling which is great as many other social media marketing tools limit this number. Social media plays an essential role in growing our blog and business and managing it becomes a lot easier when we have access to tools like ViralTag. I have personally used ViralTag for 15+ days before deciding to write this honest ViralTag review, and during this period I hardly faced any issues. Do join ViralTag for free if you want to take a test drive and see how ViralTag can do wonders. P.S. – You don’t need a credit card to sign up for a free account. What social media marketing tool are you using? Share your experience with it and how does it compare with ViralTag. Let me know if you need any specific help while setting up ViralTag. Also, do share this article with your followers and friends. 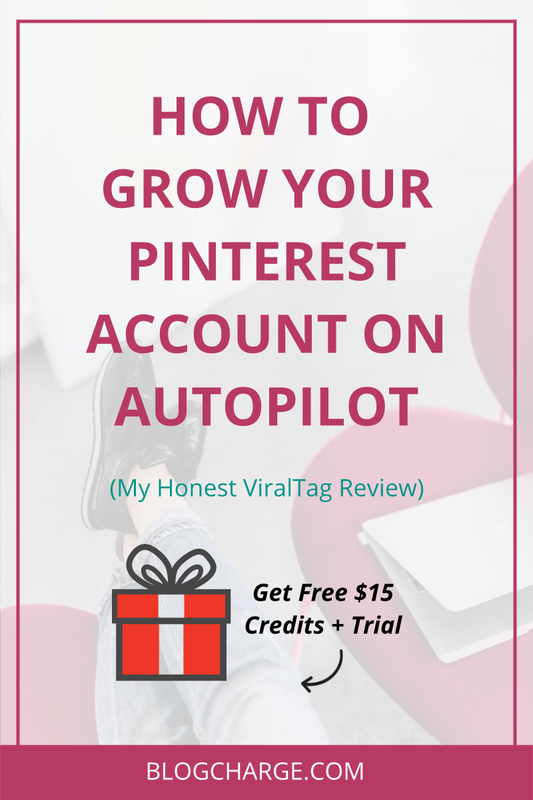 I started using ViralTag to schedule my pins on Pinterest but since it supports other channels as well, it eventually became my all-in-one social media tool. Unlimited scheduling, analytics, and other interesting features make ViralTag worth trying out and a great alternative to BoardBooster or TailWind. This review is awesome. Scheduling social media really is a great thing for your business. The pricing is reasonable for me because their software will do all the hard work for you so that you can focus on doing more work for your blog. Agree with you that automation allows us to focus on more important things like link building by taking care of social media. I searching and find your blog can you tell me which pricing is better option for tool, you mention about but I m using for my personal blog sharing. If you have a personal blog then I would suggest you try 14 days free trial and use ViralTag. Then leave an honest review of ViralTag on your blog and if approved you would get six months of usage for free. Alternatively, you can subscribe to their Blogger plan which is priced at just $12/month. It’s good t know about another social media tool. I have been using Hootsuite, Buffer for a very long time. I like the feature of analytics and sharing the visual content more than just the text. Hootsuite and Buffer are great tools and I have personally used them for some time. However, you should also give a try to ViralTag if you’re into visual sharing. Thanks for taking time to comment.